Pisanello's portrait of Sigismund of Luxemburg, now in Vienna, is placed behind a quote, possibly from the king himself. P1 Amat victoria curam –Anon. This quote about victory is fitting before an image of Rome's Colosseum. A weathered column stands behind this line from Tacitus. An Athenian tetradrachm provides the background for this quote from Plautus. Often the greatest minds lie hidden. Theatrical masks on a Roman mosaic from the Capitoline Museums drive home Plautus's point. P5 Ipsa scientia potestas est –Sir Francis Bacon? An open book lies behind this quote, possibly from Sir Francis Bacon. The trip from the earth to the stars is not an easy one. Seneca's words work well with this photograph of the Eagle nebula, "Pillars of Creation," captured by NASA's Hubble Space Telescope. Nothing is simultaneously both conceived and perfected. A bust of Cicero in the Capitoline Museums is behind this line from Cicero. P8 Damnant quod non intellegunt –Anon. Together this quote and the Bibliotheca Alexandrina nod to the Library of Alexandria, lost in antiquity. P9 Errare est humanum –Anon. Eraser shavings serve as a nice addendum to this quote. The Pseudo-Athlete of Delos, from the National Archaeological Museum in Athens, illustrates this line from Juvenal. Raphael's fresco, "The School of Athens," from the Apostolic Palace in the Vatican, helps reiterate this Hippocratic translation. Rodin's sculpture, "The Thinker," sitting in the garden of the Rodin museum, seems to ponder Descartes here. But who will guard the guards themselves? This line from Juvenal works well with this image of soldiers from Hadrian's Column in Rome. Nicolas Coustou's statue of Caesar located in the Louvre Museum is in the background. P15 Virtus et sapientia –Anon. This quote is placed before a mosaic of Sappho, located in the Piazza Museo Nazionale in Naples, Italy. God will also give an end to these things. This quote from Vergil's Aeneid looms over these Pompeiian remains, much like Mount Vesuvius in the background. I fear Greeks (even) bearing gifts. The Trojan horse, as seen on this vase from the Archaeological Museum of Mykonos, stands behind the quote from Vergil. The motto of the Olympics fittingly placed before a laurel. Perhaps someday it will bring pleasure to remember even these things. The line from Vergil's Aeneid speaks as much for the epic as it does for the Gustave Doré painting of Vergil leading Dante, from France's Musée de Brou. 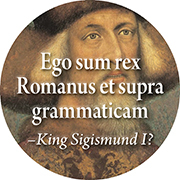 P20 Ego sum rex Romanus et supra grammaticam –King Sigismund the First? I am a Roman king and above grammar. I am a human being; I consider nothing human alien to me. Leonardo da Vinci's Vitruvian Man, found in the Gallerie dell'Accademia in Venice, is behind this quote by Terence. Not all of me shall die. The name of the poet resides in this ceiling mosaic from the Library of Congress in Washington, DC. Grant me chastity and self-control but not yet. Bottivelli's painting, St. Augustine in His Study, located in Uffizi, Florence, is paired with this quote from Augustine. Hans Holbein's portrait of Erasmus, at the Louvre Museum, provides a background for this Erasmus quote. The once and future king. Malory's words, said to be on the tomb of King Arthur, appear here alongside Arthur, as seen on the Christian Heroes Tapestry in New York's Metropolitan Museum of Art. The image of this mosaic from the House of the Trident in Delos has, since antiquity, illustrated this oxymoronic adage. This Valentin de Boulogne painting, Saint Paul Writing His Epistles, from Houston's Museum of Fine Arts, is paired with a line from St. Paul. This image of Laocoon from the Pio Clementino Museum at the Vatican is fitting behind this Aeschylus quote. Son, come home with your shield or on it. This dying warrior, now in Munich, from the Temple of Aphaea at Aegina, Greece, falls with his shield in hand behind this line from Plutarch. This quote from Thales is paired with an image of the remains of the Temple of Apollo at Delphi. Virtus et sapientia: Virtue and wisdom.